They resemble a row of giant snails, but the City of Gatineau is hoping the giant plastic shells standing guard outside a municipal building will protect employees' bikes from both thieves and the elements. 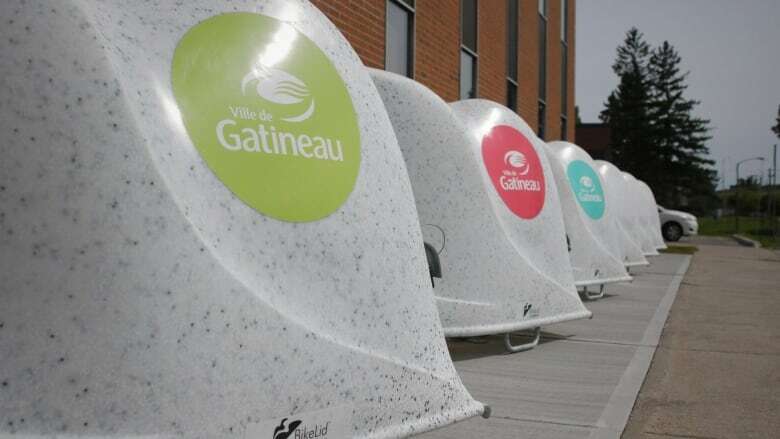 The $27,000 pilot project at 100 rue d'Edmonton allows employees to store their bicycles inside six "bike lids." Each pod can store two bikes. They're locked with a combination, and are available to city employees on a first-come, first-served basis, a city spokesperson said. The pods were installed Sept. 6. The pods were designed by Washington-based BikeLid. The company said they're durable, difficult to break into and protect bikes against the weather — even frigid Canadian winters when temperatures dip to -40 C.
The concept came about after the company's founder, Steve Voorhees, kept having his bike stolen. "Parts were getting pilfered, the handle bars and the seats," said Robin Duberow, the company's CEO. "He came up with the design, and from there it just blossomed." The pods are also designed so you can see if a bicycle is under the cover. "So, agencies that are concerned about bombs or those kind of things, they can inspect it without opening," Duberow said. The first installation appeared at the Atlanta Olympics in 1996, then others popped up across the U.S. and in Canada. BikeLid first set up shop in Canada in Comox, B.C., about a decade ago, followed by North Vancouver, B.C., Calgary, and Edmonton, but Gatineau is the easternmost location. The City of Gatineau said it's evaluating whether the racks could be deployed elsewhere.